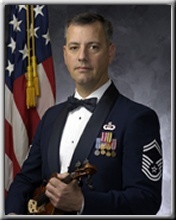 enior Master Sergeant William T. Tortolano is a violinist and Assistant NCOIC with The United States Air Force Strings, Bolling Air Force Base, Washington, DC, and Director of Operations for the Air Force Chamber Orchestra. He holds a Bachelor of Music degree from Oberlin Conservatory and a Master of Music degree from Yale University. He was a scholarship student at the Aspen Music Festival and the Tanglewood Music Festival, and served as concertmaster at the Spoleto Festivals in the US and Italy. He taught at Phillips Academy in Andover MA and was a Visiting Fellow at Trinity College, Cambridge University. Sergeant Tortolano enlisted in 1996 and was appointed Principal Second Violin, USAF Orchestras from 1997 – 2002. Sergeant Tortolano graduated from both the USAF NCO Academy and the U.S. Navy Senior Enlisted Academy where he received the Naval Heritage Award and the Award for Academic Excellence. His military decorations include the Air Force Meritorious Service Medal, Air Force Commendation Medal, Air Force Achievement Medal with oak leaf cluster, National Defense Service Medal and the Global War on Terrorism Service Medal.